Last week, it was announced that the February 25 episode of Emmy-winning sitcom "Modern Family" would take place solely on a MacBook screen and only be shot with cameras from iPhones and iPads. BuzzFeed News got in touch with the episode's director and series co-creator Steven Levitan to find out how they shot the episode. In a video originally provided to BuzzFeed News, and now available for download on iTunes [Direct Link], Levitan explains that all of the iPhones were kept in holsters held by cameramen. To avoid making the shot look like it was being filmed by a floating device, the actors were told to hold their arm near the cameramen's arm. Initially, Levitan and the crew wanted the actors to hold the phone throughout film, but they found it wasn't as east to control and that actors would misplace the devices as well as shoot off-set. The episode took over three months to complete, with a lot of time dedicated to post production as the special effects team had to rebuild OS X Yosemite from the ground up, mimicking its animations and art style while also taking artistic license to make certain things better suited for the story they wanted to tell. 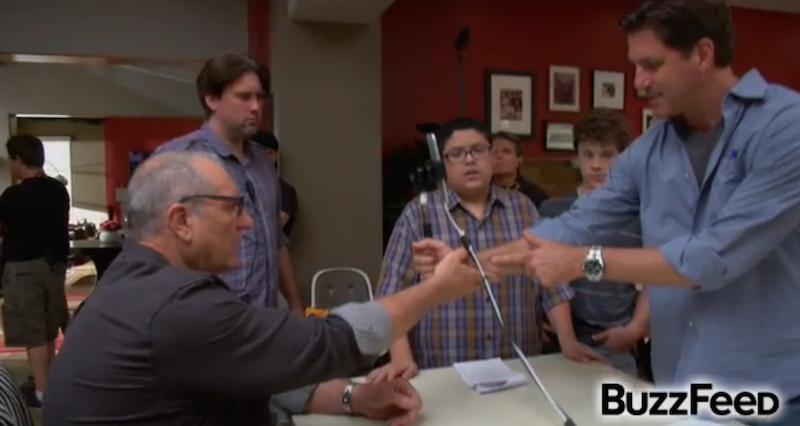 While the episode's format isn't the same as the standard "Modern Family" format, Levitan says there have been other instances during the show's six year run where they've used iPhones to shoot certain scenes. For instance, instead of staging a basketball game for a scene where a character dresses as a mascot, Levitan shot his son's basketball game on his iPhone and used special effects to splice the character into that basketball game. The episode, which is called "Connection Lost" airs Wednesday, February 25 on ABC. Meh, 3 months for one episode, a remarkable waste of time. I've always liked the show so I'm interested to see how this episode turns out. The creators of the show have always seemed to be pretty Apple friendly with the products featured on the show. The dad, Phil, even had the same iPhone 5 case as me (Belkin Grip Candy Sheer in Black/Green) and loves his iPad, which I think was a plot point in an early episode. I'm pretty sure they've used Macs quite a bit too over the years. I wouldn't be surprised if Phil ends up getting an Apple Watch at some point soon. How? iPhone and iPad is just for Facebook. they also had a whole episode dedicated to Phil getting an iPad, and perhaps a take off of MR when he states some user on the forums got one at X mall. Yeah that sounds familiar now. Makes me think of one of my first posts on MacRumors that was about how many original iPhones the Apple Stores were going to have. I don't think I've ever mentioned this, but Apple saw my post and freaked out. My friend called me and he was really scared. He recognized my forum name. He worked for Apple for a few more years before moving on so it was fine. Oh good old forum fun…always trying to get the edge on new product releases. ...or maybe 'a lot of fun and creativity for everyone involved, resulting in a funny, watchable episode of one of the few funny, watchable shows on network tv presently'? gawd, you "FIRST!" commenters are such a bore. Since all we need for a tv show today is faces and heads the next format for tv sets will be 9:16 finally. 7) Stop when done, and save the file. So how much did apple spend on this episode outside their normal payment for this show? Well, every cheap and shortlived Indian drama or sitcom (let alone the ones with decent production values) is filled with apple products. iPhones and macbooks everywhere. Apple is paying really well for product placements.